You are here: Home / Holidays, Travel & Adventure / Island Hopping in Croatia on a Cycle Cruise Holiday. 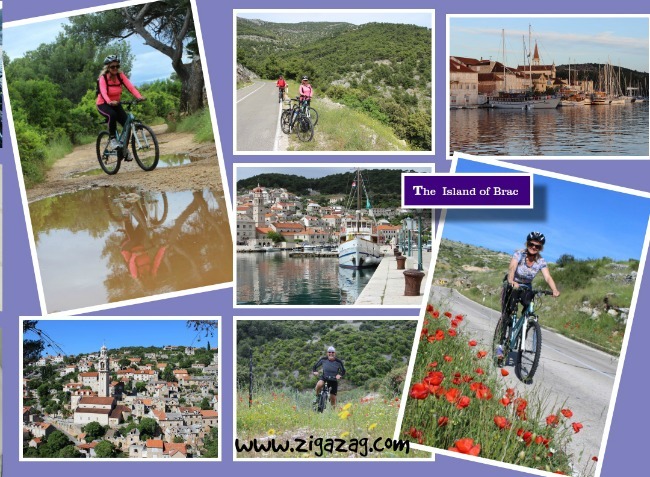 Island Hopping in Croatia on a Cycle Cruise Holiday. Looking for an interesting and active vacation? 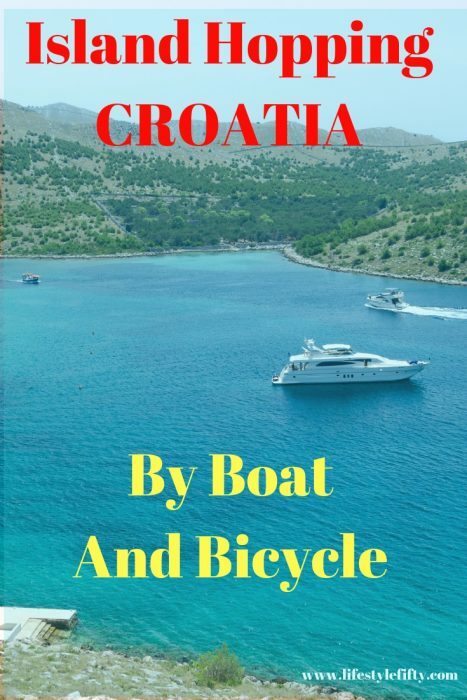 Then an island hopping holiday in Croatia that combines a cycle cruise is a fabulous way to explore, get some exercise and discover the Croatian islands. 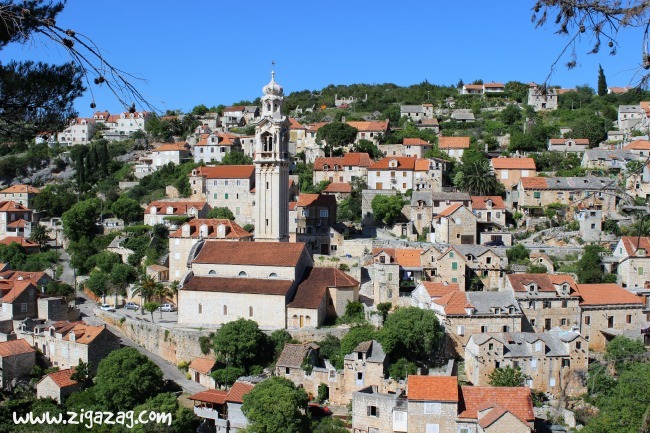 We really enjoyed a cruise in Croatia that took in the Dalmation coast of Croatia and several beautiful Dalmatian islands including Brac, Hvar and Korcula. The Dalmatian Coast is known for its long hours of sunshine, friendly locals, fabulous food and unique cultural heritage. Split and Dubrovnik are two of the most well known cities along the Croatian coastline. There are over 1000 islands in Croatia and 48 are inhabited. 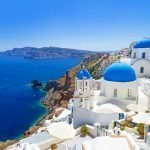 We spent a long time choosing our Croatia vacation, and looked at various sailing holidays and sailing tours because we knew we wanted to be on both land and sea. 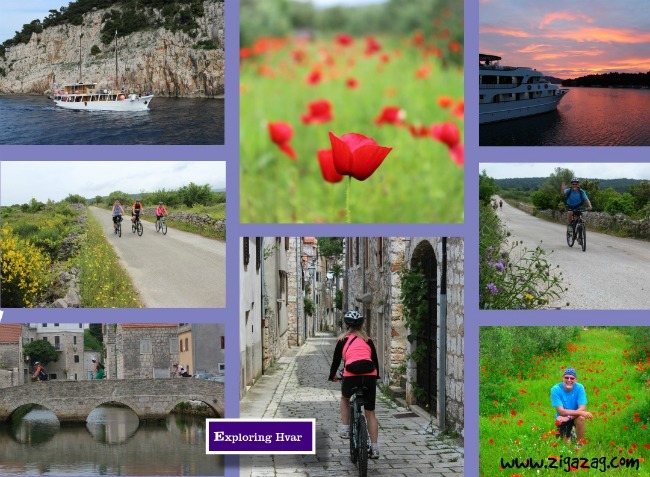 Finally we chose the Katarina Line which included an interesting Croatia bike tour, combined with a Croatia boat tour, along with a generous amount of exciting Croatian island hopping fun thrown into the mix too. The Katarina line also offers a variety of Croatia sailing trips that don’t involve cycling but take in some of the other lovely Croatia islands. You might also want to take a look at their Croatia island hopping packages too. The Best Croatian Islands to visit will depend on what you want to do. Islands run the entire coast of Croatia beginning in Istria running south, all the way through the Adriatic sea, and ending in Dubrovnik. 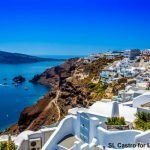 Chasing The Donkey has created an informative post detailing 10 of the best Croatian islands to visit for various different travelling reasons. 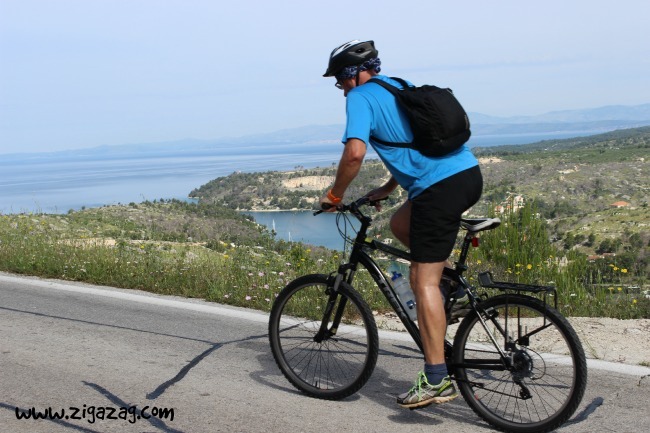 Cycle cruise holidays are a great way to explore the islands off Croatia. I’ve written previously about the Reasons to book a cycle cruise so today I’m going to concentrate on where we went, what the cycling was like and the things we really enjoyed, to give you a better picture of what to expect. It’s a beautiful two hour sail from Split to Brac island and after lunch on the boat we set sail for Milna where we docked for the night. The first bike ride started off with a taxing uphill climb which sorted us out into the hardy and not so hardy cyclists! Some of us got a little lost cycling to Bobovisca, which wasn’t a good start! But we made it … laughing, and luckily our guide laughed too. The little hamlet is on the western side of the island tucked under a mountain and incredibly pretty. When we returned to Milna we had a ride along the coast … some people also had a swim – before choosing between a number of harbour restaurants for dinner. It was a hot day when we set off for Bol from Milna, having first had breakfast on the boat, and the climb was long with a headwind. It was made more acceptable by beautiful sea views as we climbed and fields of poppies, mulberry, fig trees, pine forests, olive groves and vineyards. 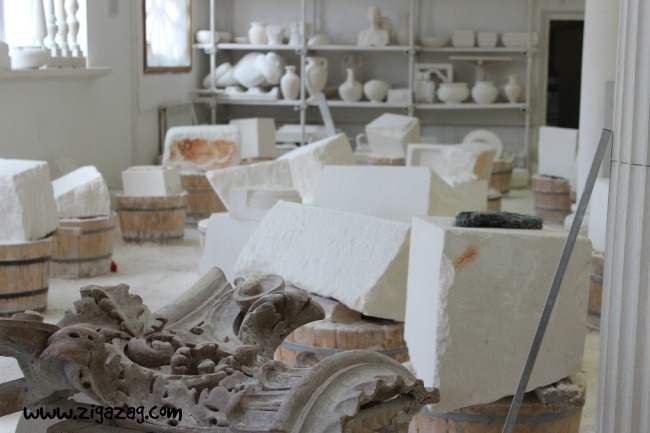 We came to a marble quarry and found out that the white marble was used for, among other things, parts of the White House in Washington and the Reichstag building in Berlin. After 35 kilometers we turned onto gravel road and wound our way to Gazul, a little shepherd village with stone houses, where a traditional Peka lunch was optional . In the photo below you can see the Peka which is cooked over hot coals – oh and us enjoying a reviving glass of the farmer’s home grown Schnapps! Then it was downhill all the way to Bol – 10kms in all, with breathtaking views of the neighbouring island of Hvar. The descent was fast and concentration was required, but arriving in sunny Bol and cycling around the quaint harbour was so picturesque. After sharing biking tales, some of us rode to the famous Golden Horn beach (approx 2,5 km from the port) and then wound our way back to the Dalmatinac for a late afternoon siesta. We didn’t overnight in Bol as planned due to high winds, but instead we cruised on to Starigrad. Food: The food in Croatia is fresh, simple and without much complication – think Mediterranean cuisine – core ingredients are olive oil, wine, and everything from the sea; fish, crabs, mussels, octupuses and cuttlefish are popular and lamb on a spit is a delicacy. Peka is a delicious traditional dish with meat and vegetables slow roasted in a cast iron dome which is cooked over coals. We also enjoyed the king of Croatian red wines, Plavac Mali. 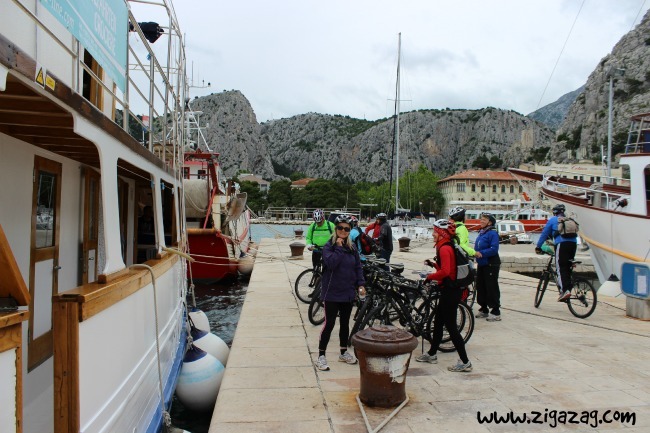 Today we were meant to cycle from Jelsa, but because the Captain deemed it necessary to change our route due to weather conditions we over-nighted in Stari Grad, and then rode to Jelsa and back after breakfast. Those that wanted to do the harder cycle and climb the hill to Hvar set off after lunch, others stayed on the boat and sailed around to Hvar. Hvar island is famous for its rosemary and lavender. The morning bike ride took us through small island settlements, fields and vineyards. It was an easy ride and very pretty. We rode along a coastal gravel road on our return from Jelsa to Stari Grad, one of Croatia’s oldest towns, dating back to 385BC when it was a Greek colony called Faros. We cycled close to the Stari Grad Plain on which was laid by the ancient Greek colonizers and is listed as a UNESCO sight. Fortified by a good lunch on the boat some of us set off up the hill for Hvar in the afternoon. It was a hard climb to the summit. We went through the village of Grablje, known for high quality wine, honey, olive oil, and lavender, and also Brusje. We bought lavendar honey from an old man selling his wares from a stall by the roadside and then cycled down to the historical city Hvar. When we had showered and recovered we explored the historic town – tourist numbers here can swell to 30,000 during high season, so visiting in April was a great option. We climbed up to the Španjol, a citadel built on the site of a medieval castle to defend the town from the Turks. We had dinner in the bustling square and over-nighted on the boat in Hvar harbour. Bike Course: Vela Luka – Korčula (approx 44 km) or Račišće – Lumbarda – Korčula (approx 24 km) – to be confirmed on the spot as Vela Luka – Korčula is very demanding trail and not suitable for less fit groups. Again due to bad weather the plan was changed a little and we sailed from Hvar to Racisce and biked to Korcula before the rain hit. It was a relatively easy ride with few hills and we passed some beautiful bays. 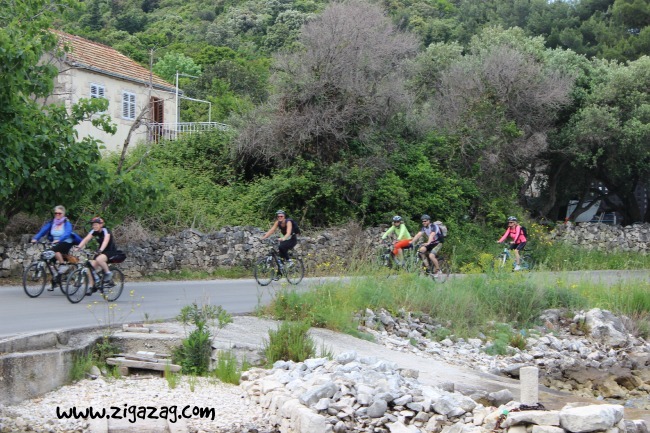 Once we reached Korcula, some people cycled to Lumbarda and back in the afternoon. Korcula is apparently the island with the most abundant vegetation on the Adriatic and along with Venice claims to be the birthplace of Marco Polo. We had a fabulous and very merry four course dinner on the boat as rain lashed down. Overnight in Korčula. Again due to rain and wind we didn’t sail to Mljet but instead we went to the Peljesac Peninsula and after a morning bike ride in pouring rain from Kuciste to Orebic we sailed on to Makarska for the night. 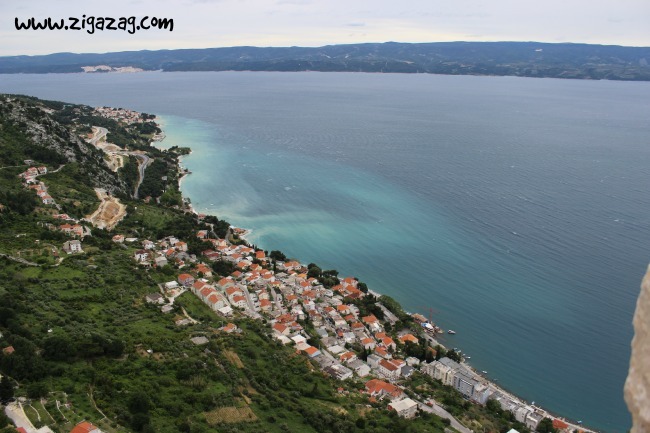 The scheduled route however should take you to the island of Mljet also known as Honey-Island. Mljet National Park has two connected salty lakes – Great Lake, covering an area of 145 ha, and the Small Lake with an area of 24 ha. You cycle around the saltwater-lake, in which there is another island where in the twelfth century Benedictine created a monastery. We rode to Radman’s Millis, a popular resort with a natural park set in the canyon of the Cetina river. There’s an old stone mill dating to the 17th century and a busy cafe. Afterwards we explored the historic town of Omis and walked up to the Mirabella fortress which once provided safety for local inhabitants from the infamous pirates of Omis. The view from the top was incredible and stretching over the entire old part of the town and the entire Channel across to Brač island. We overnighted in Omis and had difficulty choosing which restaurant to go to for dinner because there were so many. As our itinerary had changed we sailed from Omis to Pucisca on Brac island and visited the very interesting Stonemason’s School, where students are schooled in the old and traditional ways of stonemasonary. The school was founded in 1909 and emphasis in the curriculum is on the manual manufacturing of stone using hand tools only. Afterwards we enjoyed a stunning inland and coastal ride to Supetar where the boat met us, after which we sailed back to Split in the afternoon. We had the rest of the day at leisure in Split. We loved Split, the history, the buzz, the variety of restaurants and the amazing architecture. You’ll find buildings from the Classical Period such as the Diocletian’s Palace, as well as Romanesque, Gothic , Renaissance and Baroque buildings. We spent several happy days after the cruise wandering where once Roman Emperors trod, climbing to look out spots, and sitting on the Riva (waterfront) having a beer and watching the world go by. But that’s not all we did … if you’d like to find out more about Plitvicke Lakes and Trogir, you’ll have to pop back to ZigaZag soon! Breakfast at 9:00 am, a debrief session with a representative from the Katarina Line, and then it was a sad farewell to all our new friends and time for onward journeys. We sailed with the Katarina Line which offers a variety of cruises including sail, hike, bike or sun and fun trips around Croatia. The crew of the Dalmatinac were awesome (top chef too!). 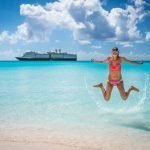 Booking on a cruise means that you don’t have to worry about finding out about and booking ferries to other islands, you don’t have to think about shopping for food or cooking when you are tired. Two meals a day were supplied on the boat and included in the price. Either lunch or dinner each day was at our own cost off the boat. Meals on the boat were 3 or 4 courses, and breakfast consisted of cereals, toast and fruit, although a cooked breakfast cost extra. Bikes were hired at extra cost. Sailing around Croatia was a trip of a lifetime. If you are looking for a Croatian boat holiday, Croatian island cruises or a Croatia Island hopping holiday that includes cycling, then take a look at The Katarina Line cycle and cruise holidays. The shoulder season months around high season and school holidays is the best time to visit. Sailing around Croatia can still be lovely in the off-season. We travelled in April. May, June, September and October are probably the best time to go because the days should be pleasantly warm and the weather should also be nice for swimming. If you are travelling in high season, expect crowds on some of the more popular Croatia islands, such as party island Hvar. Never travel without travel insurance. We travel extensively and either use 1Cover Travel Insurance or Cover-More Insurance for our travel insurance needs. We’ve been happy with the service and cover from both companies. Always compare at least two policies to make sure they suit your own specific needs, and your budget, before you purchase an insurance policy. This post contains affiliate links from which I stand to earn a small commission (if you buy from them) at no cost to you. Lifestyle Fifty Website is a participant in the Amazon Services LLC Associates Program, an affiliate advertising program designed to provide a means for sites to earn advertising fees by advertising and linking to Amazon.com. 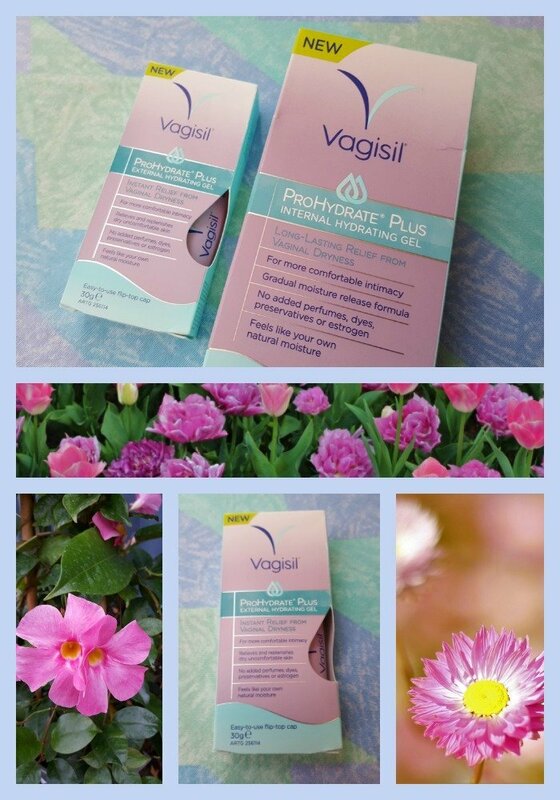 Thank you to everyone who supports my blog. Previous Post: « How to Stop Worrying, and Start Living. We’ve had a great interest in visiting Croatia for quite a while now, but haven’t taken the first steps to figuring out how to make it happen. You’ve just given me some wonderful ideas about how to do it right. Love the idea of enjoying the country by bike and boat. I am looking for a cool place for a cycling trip and this fits the bill. I still have not been to Croatia so double bonus. That’s great Charles – hope you enjoy it as much as we did. I’m not a cycler but can see this would be a great way to see this part of the world. I hear more and more about Croatia and while it has never been on my radar before you have put it up another notch as a possibility for future travels. Croatia is definitely a place to visit Debbra – there is so much to do and see, the culture and history is fascinating, and if you go shoulder season you’ll avoid the crowds. 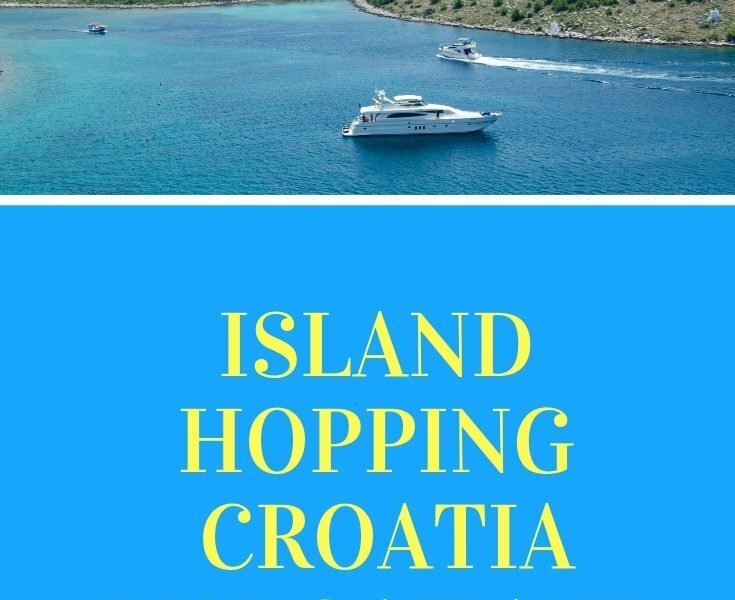 We’ve been considering cruising the Croatian islands and love this post for continuing to keep my travel bug itching. We are contemplating using the wonderful ferry systems that links Greece, Italy and Croatia. . .you’ve moved the islands higher on our ‘to do’ list!! Great that I’ve moved the islands of Croatia higher up your to do list Jackie 🙂 How wonderful it would be to visit Greece, Italy and Croatia via ferry too. Enjoy. Sea Princess World Cruise Facts and Ultimate Ship’s Tour. Discover behind the scenes secrets. 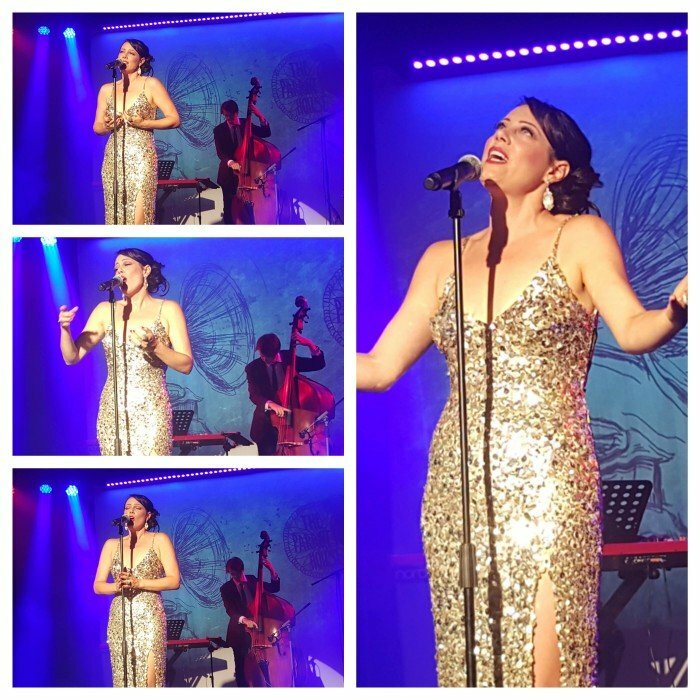 Find out about the inner workings of Sea Princess on one of the more unusual Sea Princess cruise excursions you can do. Things your mother never told you.